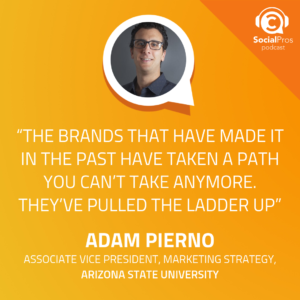 Adam Pierno, the Associate Vice President Marketing Strategy of Arizona State University joins the Social Pros Podcast to discuss how universities can leverage social for powerful branding. Branding today is worlds apart from what it used to be 100 or even 10 years ago. The strategies used back then may as well be locked inside a time capsule and tossed into the sea. The world has changed. 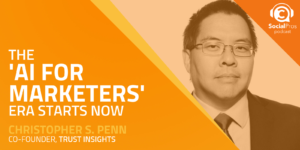 And, the way brands use social media to engage with their audiences has changed. Nobody knows this better than Adam Pierno, who understands how to build brands by finding what is meaningful to their target audiences. 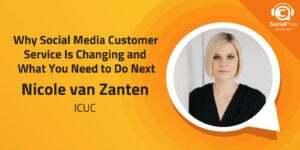 Brands can learn more about their ‘best customer’ from observing pop culture than staring blankly at a soulless growth chart. 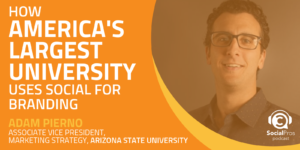 And, when you’re America’s largest university, knowing how to integrate brand components to create a consistent persona across all your social channels is vital. 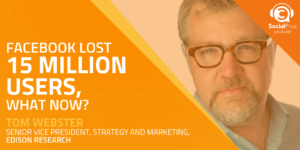 A mistake that many brands continue to make is when they try to become a student of the platform or a student of the tools. As Adam teaches in his new book, ‘Specific’, you’ve got to become a student of the audience. 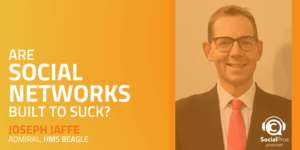 In this episode, Adam reveals how you can do just that and reach out to your audience in a way that feels personal and specific to what they care about on social media today. A lot of people become students of the platforms or the tools, when they should really become students of the audience. Adam would choose to talk to Lenny Dykstra, even though he’s currently facing time in prison and has been jailed for multiple convictions throughout his life. Still, the man’s got a few stories he could tell!